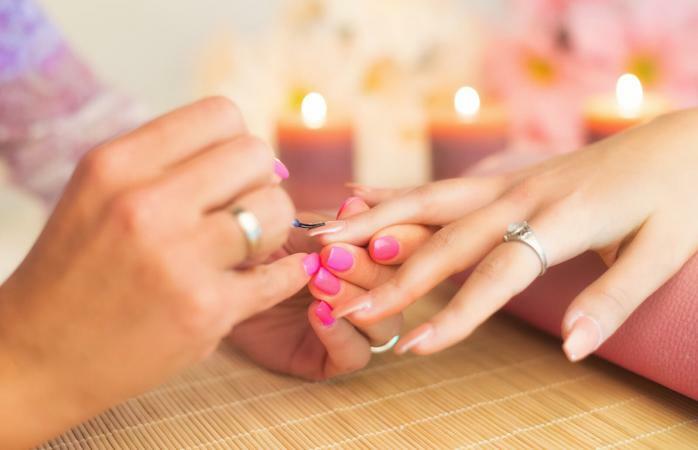 When you use nail brushes to apply acrylic to your nails, they can easily experience a buildup of product and residue. That's why it's so important to clean your brushes regularly to make them more effective in the long run. There are two different ways you can do this: through a purchased cleaning product or by using a DIY technique. There are many nail brush cleaning products that you can purchase alongside monomer in order to make your brushes look shiny and almost brand new again. The best thing about this method is that it won't strip too many oils from your brush to make it dry or brittle. Your acrylic brush that needs cleaning! Pour a small amount of your brush cleaner product into a little glass jar or container. Submerge your brush into the liquid for 10 seconds. Drag your brush back and forth across a piece of paper towel to get rid of any residue. Hold your brush upside down for around one minute to let the liquid saturate within the bristles. Press one side of your brush down on another piece of paper towel to remove any excess liquid. Dip your brush into monomer solution so that it retains its natural shape. Leave your brush to air-dry for two hours before it's ready to be used again. If you don't have a nail brush cleaner on hand, this might be the method for you. Pour a small amount of 100 percent pure acetone into your glass jar or container. Put your brush inside the container and let the bristles soak for 10 minutes. Place your brush on a piece of paper towel and push down gently on the bristles to remove any excess liquid. Use your metal cuticle pusher to scrape off any acrylic residue. Dunk your brush in the acetone and then take it out and repeat steps 3 and 4. Keep repeating steps 3-5 until your brush is looking clean and acrylic-free. It's important to take the time to remove all the acetone from your brush, otherwise, it might interfere with the acrylic the next time that you want to use it. Let your brush air-dry for two hours before using it again. The most effective cleaning method can depend on the type of nail brush you are working with. Small acrylic brushes that are used for nail art or small nail beds (like your little finger) might need a little rinse with lukewarm water before you start cleaning them. This will make the brush moister in preparation for the brush cleaner or acetone. It is actually possible to use the brush cleaner alone with small brushes to achieve great results. Large brushes of reasonable thickness might not seem super clean if you solely use nail brush cleaner. To be on the safe side, you could use a 50 percent nail brush cleaner and 50 percent acetone combined method. In this case, follow the nail brush method and then use steps 3-7 of the acetone method for maximum effectiveness. For a soft brush - Mix your monomer with acetone (50/50) and attach a clothespin to your brush to hang it up over your jar. Leave it for two days so that the acetone can evaporate to leave you with a soft, silky brush. Use monomer for daily cleaning - In between thorough washes, wipe your brush gently after use and then simply dip it in your monomer solution before you let it air-dry. Fix misshapen brush bristles - Coat your brush bristles in mild liquid soap and leave them to soak for 48 hours. Proceed to rinse the brush in cool water before dipping it into your monomer solution. Leave your brush to air-dry for about two hours before using it again. It's easy to get rid of acrylic buildup and residue once you know how to. Whether you choose to use the nail brush or acetone method, or a mixture of both, keep persevering and it'll only be a matter of time before your brushes are looking clean and fabulous again. You'll be back to creating gorgeous nail designs in no time.